‘We Did Participate In A Hoax’: New Documentary Reveals How Bush Administration Lied Us Into Iraq War - The National Memo - Smart. Sharp. Funny. Fearless. David Corn at Mother Jones offers a preview of some of the new information coming Monday night in Hubris: Selling the Iraq War, an MSNBC documentary based on the book of a similar name by Corn and Michael Isikoff. The facts of how the nation was conned into going to war, Maddow has argued over the past week while promoting and previewing the new film, are important to understand in order to avoid the same thing happening again. “If what we went through 10 years ago did not change us as a nation — if we do not understand what happened and adapt to resist it — then history says we are doomed to repeat it,” she warns. —A November 2001 briefing memo declassified two years ago and used by then-Secretary of Defense Donald Rumsfeld during a meeting with General Tommy Franks, details how the administration hoped to trigger a justification for going to war in Iraq. One of those triggers, the memo suggests, was to be a “dispute over WMD inspections,” akin to the one which was eventually, and very publicly, manufactured to help fuel the phony case for war. Is there any way we can tap into the Bush, Cheney, Rumsfeld, Rove and Wolfowitz resources to pay for the injuries to all the servicement? I wish we could. They are war criminals. How about the present aggressive actions this President has taken? Or is a Democrat committing aggression against others okay? Trashing just Bush etal serves no purpose except to prove/advance partisanship. Are the kids getting killed in the last four years different from those killed during Bush’s term? Or does ignoring those deaths okay since they happened under a Democrat. H0w about the children that have been murdered in the last two years by drones? Or don’t these kids matter? Be consistent in your critisim, that all I ask. Option31… we’re now killing the children of fathers that we killed in an unjustified invasion, we’re killing the fathers of children we killed in in an unjustified invasion, we’re killing the brothers of men we killed in an unjustified invasion. If someone killed your child… or your father… or your brother in an unjustified invasion, and they were living in the local hotel or had built a camp outside of town… what would you be doing today? You reap what you sow also applies to nations…. Obama at his worst cannot compare with the arrogant dishonesty, ignorance, and rush to war of his predecessor, nor with Bush-Cheney’s negligence in protecting the country. He has not yet fabricated evidence to get the country involved in a completely unnecessary major war, and – for all his faults – it seems unlikely that he will. Option, you appear desperate to spread blame rather than address the reality of the Bush regimes’ crimes. And acting as though it was possible for the Obama admin to simply walk out of Iraq and Afghanistan within a few months of taking office makes you seems somewhat unaware of how difficult it is to stop a war. Obama’s performance in office regarding the two wars Bush and company started is a completely different topic from what is covered in this documentary. Your statements make it appear as though you’re trying to distract from the criminal acts of the Bush/Cheney regime. Not desperate to spread blame, fact is their is plenty to go around including anybody that does not our leaders out. I agree we were lied to on Iraq, always did see that. One did not have to be a rocket scientist to see through the lies. However this admin is no different, just more competent about it. How about the criminal act of sending drones into a country that is not we are not at war with? Their is plenty of criminal activity – past and present. Past criminal activity should be prosecuted and so should present illegal activity. BOTH have the blood of innocents on their hands. The only fact is that according to most International Human Rights organizations over 600,000 Iraqis were slaughtered during the invasion, over 2 million Sunnis fled the country, and the infrastructure of a developing country was destroyed to satisfy the desire for vendetta, pursue business opportunities, and pave the way for the re-election of the most pathetic and ineffective President in the history of the USA. Don’t confuse a few dozen civilians killed by drone strikes against Al Qaeda targets in Pakistan, Yemen, Somalia and Afghanistan with the invasion of an entire country and the slaughted and destruction that followed. Ideally, the world should find ways to coexist and live in peace, unfortunately reality suggests Nirvana is nothing more than an elusive chimera. And so do you for voting for Bush. Nope! thought he should have been impeached and said so 12-01 when the spying on e mails broke. I do not vote for criminals – of either party. I actually consider their actions instead of their words. And no, the current administration is not just as bad. I agree that we have some issues, such as civil liberties, to still deal with. But it simply does not compare to the Bush administration. Thanks. Could not have said it better. It is awfully difficult to stop an out-of-control train by just throwing the brake. Obama and his administration have done everything possible to extricate us from both Iraq and Afghanistan, with both countries still intact, and the US still with a modicum of international respect. At the time of the Iraq invasion in 2003, and the build up to it over the previous year or so, many Democrats at least had an inkling that Bush and his team were lying, about all three issues discussed in the above article. Before Bush and his crew left office there had already been many books written regarding the lead up to invasion of Iraq, and the apparently purposeful ignoring of Afghanistan, although that is where our attackers originated from. While Powell may have had no clear knowledge of the authenticity of the Bush claims regarding Iraq, he at least had some questions, and could have taken some steps to distance himself from the administration, making his chances for future public office much stronger, and doing a great service to his country. Instead, he stood back and watched the train pull out of the station. By the time we had entered Iraq and had found no WMD or nuclear capabilites, Powell should have made his concerns clear. Instead, basically all he did was to step down as Secretary of State at the end of Bush’s first term. Rumsfeld and Cheney STILL assert that what they did was correct. I honestly believe that, as stupid as Bush is, he was not entirely aware of what was going on. In fact, I believe he STILL doesn’t know where Iraq is located, which in no way relieves him of responsibility. Perhaps this is part of the reason that he has not appeared in public much in the past four years, not even at his own party’s nominating conventions in 2008 and 2012. People who want to put the responsibility for these two wars on Obama’s plate, some merely because he was among pretty much all of Congress to approve the force resolution, fail to realize that Obama, at the time, was NOT president, nor was he even under consideration. At the time, there were many other Democrats and Republicans who were closer to the front of the line. It is entirely too easy to reinvent history to suit your purposes than to face the music of history your leaders have created. Perhaps you would be so kind as to list some of the present aggressive actions this president has taken, the new wars of choice, new torture techniques on the approved list, new countries invaded under false pretexts, new prisons in which habeus corpus does not apply. Trashing shrub the ultra wuss is the most patriotic thing any real American can contemplate. We’re still having to clean up the mess those chickenhawks made back then. We lost our national honor under bush the wuss. Honor, it’s like virginity, damned hard to regain once lost. Drones used against Pakistan, Yemen and targeting of US citizen WITHOUT A TRIAL! Brennan withdrew his name from consideration for Director of the CIA in the first Obama administration over concerns about his support for the use of torture by the CIA under President George W. Bush. So now the name calling begins, LOL, yea I’m a troll because I think ALL leaders should be held accountable and not given a pass because they have the right letter on the end of their name. In the past, a traitor to this country was hanged. The Rosenbergs were sent to the electric chair for being suspected of espionage. An American who joins the enemy is an enemy and deserves his fate when he gets killed in the melee. I don’t think we should use drones, but I haven’t seen a list of how many children died in drone strikes if any. This country has become warlike. We need to fix it. What we don’t need to do is to politicize everything. Not an unreasonable request.But consider that our forces had to begin fighting insurgents that were not in country prior to our devastation of it. What a wonderful environment we created with the overkill to remove a petty tyrant. al-quaida,and other terrorist insurgents were not there before any more than the wmd’s because Hussein was the primary terrorist in Iraq and was determined to remain so. al-quaida and similar groups thrive on disarray,and we gave it to them.Many Americans who are now paying more than $4. a gallon for gas would have loved to see the market glutted with Iraqi oil but of course the gas and oil industry must protect its bottom line at all costs and God knows that it has cost too much.How crafty old George senior was to not finish the job during the gulf war.He knew that he would need to leave something for junior to do when he reached the Whitehouse.A chance to play cowboy,an opportunity to make it look like he was doing something,since he wouldn’t be leading the country,president or not.Lesson in a nut shell is that you don’t need a bomb to kill a fly and telling the country that you do is criminally dishonest.America,as well as the rest of the world deserves better than that! There is a difference between lying your countrie’s way into a war and having inherited it and trying to get out without everything disintergratins. The sad part is, how do we pay for the lives. You don’t pay for the lives. We who have lost loved ones are the ones who paid that price. There is nothing to compensate for the loss of my only son. So true ! My heart goes out with you and your family ! This is irreparable ! In addition to seizing their resources, I would like to try them for murder, with the trials being held in Nuremburg. I hope that tonight’s audience will connect the dots: The party that will not be dominated by fact checkers is the party that brought us the Iraq War based on a hoax. Lying and cheating are not only disrespectful in ways that undermine the fabric of a society like ours, but are ultimately self-destructive. I hope the American public will not turn away in disgust, but will instead face up to its betrayal by leaders of a party many voters trusted. It may take months for the public to digest this kind of an insult. One can only hope that by the 2014 elections, enough voters will have processed this awful news and will be eager to act on their outrage. By the way—have you noticed that Ms. Tuckers column on how Black History Month has been abruptly moved from home page? Replaced now by her February 6th article? Mr. Consaon: and Editors what is the purpose of this censorship? I remember watching the UN presentation. I remember Colin Powel’s presentation. I said to my friends, who were watching it with me, that looks like a water truck. This was the supposed mobile chemical weapons unit. It turned out to be a water truck. I remember Condaleza Rice’s mushroom cloud. These perps should be charged. There are several countries who have tried them in absentia and found them guilty. They cannot go to these countries or they will be arrested. mind that Bush and Cheney are guilty of war crimes. Absolutely! There are several foreign countries that have already tried them, in absentia, and found them guilty. They cannot go to those countries without being arrested. Does anyone have to ask? What bothered me the most when the deceit designed to convince Americans of the need to invade Iraq was not what the Bush administration was saying, but the fact that so many fellow Americans believed that garbage. 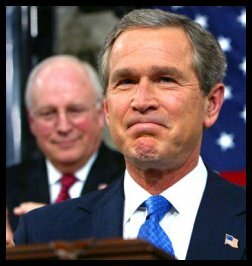 Cheney and the neo-cons were determined to invade Iraq and remove Saddam Hussein from power since before Bush-Cheney were elected. Saddam signed his death sentence when he rejected contrat offers put forth by Cheney on behalf of Halliburton, and by Rumsfeld on behalf of Bechtel, and gave those contracts to Russian and French companies. The demonization campaign against our former ally, during the Iraq-Iran war, began immediately thereafter, Saddam made it easieer for us when he had the ill-fated idea of invading Kuwait. That was the excuse we needed to act. The WMD excuse, which was focused on the claim that not all the WMDs the Reagan administration gave to Iraq had been destroyed, was the icing on the cake. The ultimate example of deceitful strategy was the way Bush managed to convince the American people that Hussein was somehow involved in 9/11, without implicitly saying so. A population traumatized by 9/11, and unfamiliar with world geography and history, was easily misled by people determined to pursue vendettas, help their supporters by granting them lucrative sole source contracts, project the illusion that something was being done to avenge 9/11, and pave the way to guarantee the re-election of a man whose ambivalence and ineptitude contributed to the worst terrorist attack on U.S. soil in our history. McCain, we will be right back in another situation just like Iraq. McCain is gung ho for strikes against Iran. That would be a disaster. Iran has a well trained military and the other Arabian countries would go to his aid. Mideastern countries stopped trusting the United States when they invaded Iraq. Republicans fell for Bush & Cheney’s bs because they think alike! We could see Colin Powell distanceing himself further and further away from the Bush administration as the Iraq war carried on and no WMD were found! Colin Powell learned not to trus Republican politicians the hardest way possible when his trust was betrayed! Where else in this world could money hungry greedy politicans get a country’s army engaged in a war for oil $$$$$$$$$$$$$$$$$$$$$$$$$$$$$$$$$ killing our American citizens fighting this bogus sham of a war Bush & Chaney put together? France saw thru the sham and refused to get involved not believing Bush & Cheney’s lies! Then there was GWBush holding hands with the Saudi Prince at his farm in Texas for all the world to see!!!!!! Blantly walking hand in hand with his partner in crime under our noses! Republicans loved it! Michael Moore’s documentary finally turned the tables on Bush and Cheney about Bush senior and junior’s associations with the Saudi’s oil dealings! Same reason Saudi’s planes flew out of New York just before the attack on 911! Republican lies are keeping them out of our White House presidency but not out of politics affecting our everyday lives. Voting is our only chance to chage this downward spiral into servitude! How about we just write our Congressmen and Senators and see these douchebag ChickenHAWKS go to jail. My question is why these people have not been prosecuted? They are at the very least guilty of treason. An inquiry and serious questions have to be asked. Cog, you are right. We should have tried them, in this country. Makes ya wonder if these turds have investments in cosmetics and wrapping paper. Here’s wishing they have a close encounter with justice,permanently! The one piece of the puzzle that is being danced around is that the Iraqi war was about MONEY!!!! There was a ONCE IN A GENERATION chance to syphon Hundreds of Billions of Dollars out of the economy and funnel it directly, and indirectly, to the Industrial – Military complex. That, coupled with the most extreme tax cuts for the wealthiest people and companies in America, created an irresistible opportunity for the Bush administration to create an enormous transfer of wealth to those who were already wealthy beyond imagination. So what if we had to sacrifice a few thousand lives? As long as none of them were our own families, no big deal. And for those who think I am a Johnny Come Lately to the opposition of the invasion, NOT TRUE! I made it quite clear to anyone that I knew that I felt this was a huge mistake. On that point, I was wrong. It was not a mistake. It was a deliberate, Treasonous act on the part of the Bush administration. At the same time, they privatized military services and sent subsidiaries of Haliburton to Iraq. What doesn’t seem to be strange to Republicans is that the first thing those companies did was to build a road to the oil fields. And then Blackwater was found cheating the government and will still be able to get government contracts. Then there was the crooked act of awarding no-bid contracts to those crooks. You’re a perfect example of what the Republican Party has degenerated into. Even with the overwhelming evidence in front of you, all you can think of is trying to deflect blame from the guilty to those innocent of the crime. Bush, Cheney, Rove, Wolfowitz and the rest of the neocons are truly the scumbags of contemporary American politics. Their mendacious prattle is now bare for everyone to see, yet they still try to absolve themselves of guilt by claiming that they’re not the only ones who practice deceit. They probably won’t succeed, but they’ll always have dupes like you to plead their cause. Add a comment..What was done to silence the scam you only see the tip of the iceberg. Then the assassination of the Hussein family and hanging of the dictator himself . This President should be accountable. If a CEO of one company Kills the CEO and board members to take over the another company would that be acceptable? We must get rid of the double stand ard and make our elected officials responsible for their actions. As I read more of your pathetic excuses, I realize that you are a lying jackass. I’m offended that you may really believe I would be so stupid as to accept your demented rationalizations of the acts of the Republican neocons. You are truly an amoral piece of crap. I wish that we could try Bush, Wolfowitz, Cheney, Rumsfeld, etc. for war crimes, but I seriously doubt that will ever happen. So when do we demand that these chicken hawks be charged with war crimes? Day after day we read articles from people that point out the problems, bribes, theft, and lies that are breaking America’s back and yet no one does anything. Why?? STOP IT…STOP IT…..STOP IT … YOU STUPID PARTY! You HYPOCRITES, You PURVEYORS of LIES !!! Lots of Good Men and Women and Children are DEAD and many many more injured. We KNOW these guys HOAXED a fine man, whose word carried weight (Colin Powell) and convinced many what was untrue, to get a war and to get richer than they already were. We need to bring these men and woman(Rice) to JUSTICE. Quit screaming about Behngazi, YOU JACKA$$es ! This far outweighs that. Start with Jail then take their money, which they worship. This is America “WE the PEOPLE” can DO THIS ! Write your congressmen….Write your Senators and if they fail VOTE the scumbags OUT !!!! NO MORE P.O.S. G.O.P. !!! We know who you are, you have been weighed and you have been found wanting…your days are numbered. continue the fights by all legal means. If we had thrown in the towel and listened to likes of FOX news and even the very surprised “Piglet in a suit” Karl Rove we would be looking at the BULLY Romney as our President today. I’ve wanted all of them to be tried for war crimes. It makes me sick to know we attack a country because GW wanted revenge for daddy. Then he believed we would be seen as the great liberator. They would let us take control of their oil fields as payment. What a joke. Not only did we never take control of their oil fields, we lost over 4,000 service members. Over 32,000 injured. Many permanently. The suicide rate of our veterans is horrible. Over 100,000 Iraquis dead. Oh and we added 3 trillion dollars to the deficit. I have been trying to get Bush and Cheney tried since 2007 and all I get is a run around. They ignored the warnings of the Security departments that 9-11 was going to happen, Bush helped Bin Loden’s family leave the US after 9-11 and the lie that got us into the Iraq war. The fact that 3000 lives were lost on US home soil should have lead to all kinds of investitagations but none were done. There was never any kind of hearings after it was learned that there wer WMD in Iraq where thousands of people have lost their life, no hearings. There was 3,000 lives lost on 9-11-01 on American Soil no Republican or Democratic hearings as to why it happen. There was 4 lives lost last year on 9-11 on foreign soil and the Republicans are still holding hearings on the lost of those 4 lives and trying to show a cover up. Three thousand lives on US soil plus thousands of lives lost in Iraq and Afganhistan should mean more than the 4 lives lost year yet the Republicans don’t think so and their actions and words show it. Bush 2, Cheney and everyone in the Bush 2 adminstration should be arressted and tried as the war criminals they are. We’ve been lied to before VietNam, you know. The last war we “won” was WWII. Think about it. Thanks you for bringing up Vietnam as I was just telling a conservative extremist this the other day, and he was ignorant of the fact that we were told we had to stop the evil communists there before they attacked us back home in the USA. The facts are the S. Vietnam government collapsed in 1975, and in the 37 years since then we have have not been attacked. If my memory serves me right the big oil companies and Johnson Friends like a Texas Construction Company (Brown & Root) got a contract to dredge the Bay of Ton-ken because they were convinced the Mae-Cong Delta was rich in oil deposits (which it wasn’t) …. HMMMM !!! Does anyone see the Big Oil Texas Businessman connection to all these wars in Asia ( SE or SW) We have had three Presidents from Texas who had connections to Big Oil, and we have fought three wars for these interests. Just food for thought, and maybe the historians. Since the issue is lying or covering up attacks against America we need to re-visit the lies that caused all this mess. The bogus Iraq war and the people that lied us into it regardless of how many unsuspecting people voted on it since now the truth is out- Investigate it-all of it. Somebody should be held accountable for all these deaths. Just as Americans have opposed any war criminals around the globe then we should practice what we preach. The current GOP wants to forget how we got here and how the debt rose to current levels. But they want average tax paying Americans (some without jobs) to pay for the lies of a few that mostly benefitted financially during the war, mortgage, Wall street, out-sourcing scams and all other treason acts to the nation. They continue to want war based on failed logic and want the millions of Americans to give up access to government funds to pay the tab left by policies of the GOP over the past 3 decades. This is not by accident that America is in this condition, this was a plot to destroy equality of Americans for corporate governance of the taxpaying people of America. The truth is out and we should pursue to rid the nation of such cowards. Is option31 an American? I gather from his conversation that he would rather that American men and women be on the front lines getting killed, does he have any children of age to go to war? My understanding of using drones is to prevent our people from getting killed, of course I don’t say the hell with their kids getting killed but that comes under causlities of war if they, the enemy persist in killing Americans, then they must suffer the consequencies and any Americans getting killed by our drones deserve what they get, once they join they enemy against us they are no longer Americans, they are merceneries and they deserve what they get. You can’t have both sides of the coin, either you are with us or you’re against us take your pick, it’s unbelievable you claim to be an American yet you are constantly questioning the way we take care of the problem, then I say to you go join the other side since you are constantly taking their side, all I can say to you keep your eyes looking up we got a present for you coming. For your information drones are directed at targets where insurgents are hiding and not known to have kids hanging around. Like I stated before I take no pleasure in killing women and children but the enemy chooses where he wants to fight and our job is to take them out where ever we find them, in order to save American lives, I feel no guilt about that. How stupid and sad! all because little bush listened to Cheney and the Neo-Cons lead by a foolish idiotic Rumsfeld [bad things happen in creating democracies ] Really! I went through the comments and feel fortunate to see that almost 99% readers are in agreement with mine, those I posted on The HuffPost during the war and in our national dailies, for more than a decade ! Now is the time to take the mass murderers to the ICJ, Hague. This will at least console the aching hearts of thousands of relatives of US troops and the innocent people of Iraq and Afghanistan, those wee compelled to embrace death by the order of GWB. So how did Bush, Cheney, Rumsfeld get Clinton, Albright, Dianne Feinstein to lie as well? You might try reading The Commission On the Intelligence Capabilities of the United States Regarding Weapons of Mass Destruction–it’s easily found on the internet. I saw Colon Powell on television last month and he affirmed this report. The left wing propaganda machine just cannot accept this version. Given that you may be right why did we undertake nation building when Obama was calling for us to withdraw Bush doubled down and at least quelled some of the violence We should have just removed Sadam and let it go at that we did have some justification to do that. The National Memo is the most irritating add that refuses to go away that I have ever encountered. In 2008, prominent Senate Democrats in extremely partisan conclusions to a four year bi-partisan investigation nonetheless, exonerated the Bush Administration and stated repeatedly that the prewar statements by the Administration with regard to every major assertion that might have possibly motivated Congress and the American people to support holding Saddam Hussein accountable for his blatant and arrogant disregard for a long list of U.N. resolutions were ‘substantiated’, their word…used in nearly ever instance, by the intel provided to the Administration by the intelligence community. Clearly the partisan press release by Senator Rockefeller, the chairman of the committee, that misrepresented the findings carried more weight and got far more coverage than the actual conclusions and details contained in the Senate report in the same way as the plethora of other unsubstantiated and unsupportable assertions did. I realize that the above fact and any others that I could have posted will be marginalized and that insults will likely follow. Like others, I have sought to overcome the gross distortions that are now considered common knowledge with the actual facts to no avail over the years. I’m not interested in doing so again. As with others that have actually researched the facts, rather than simply parroting rhetoric, I will sit back and study the art of lying and distortion by the masters of it in the media and wonder how people could possibly believe that the Bush Administration would not have been tried and convicted if even one-tenth of what is asserted were true. Sometimes I feel like I’m playing the role of the late great Paul Harvey. It’s very sad that the masses can be manipulated to such an extent. So successfully that reviving those passions and the ginned up hatred in order to distract from the important concerns of the day and to demonize Republicans and ‘Conservatives’ generally will likely be just as successful. For the record, I am far from a supporter of former President Bush on numerous issues. I do however support the truth over propaganda, however fruitless it has proven to be. My sympathies go out to parents such as are represented by the poster here named Karen Meredith. The debt owed for the dedication and sacrifices of those who are willing to go into harms way in our stead cannot be overstated. No mention of how Saddam Hussein was one of the finest people of our time. He is up there with Mother Teresa, Martin Luther King and Nelson Mandela. Actually I agree with the late Christopher Hitchens- Saddam had to go- he was linked to many terrorists and would have linked to Al Quaida but G.W. Bush and company should have been impeached for the stupid way they conducted the War. I also question David Korn’s figure of the war costing 3 trillion, it was more like 2 trillion. Like it or not we will be fighting terrorist for the next century. The cost of the war continues to this day and will for many years to come.Like many of the others in this country I was fooled into thinking they were right. I discounted the opposing voices and even vote him back in for his second term. In short I was a fool I thought I had learned my lesson after Nam I was totally against that war but bought into this one. Never again as long as I live will I be led to war by our government. only to think that idiot Cheney said he would do it all over again if he had too.